For lunches this week, I’ll do turkey, ham and cheese, and peanut butter and jelly sandwiches. I’ll also eat leftovers from dinner. Out of the ten patterns that I purchased for $1 each at JoAnn Fabrics, here is the first one that I made. It’s Simplicity 3887. 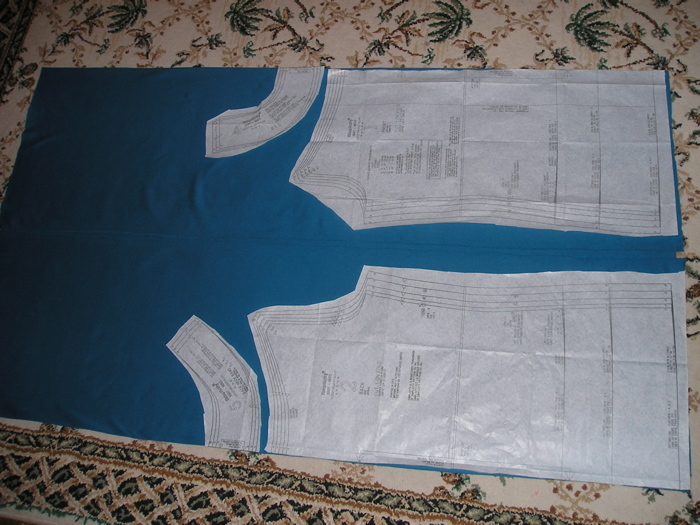 I chose a blue jersey fabric to make the white, short-sleaved shirt on the pattern above. 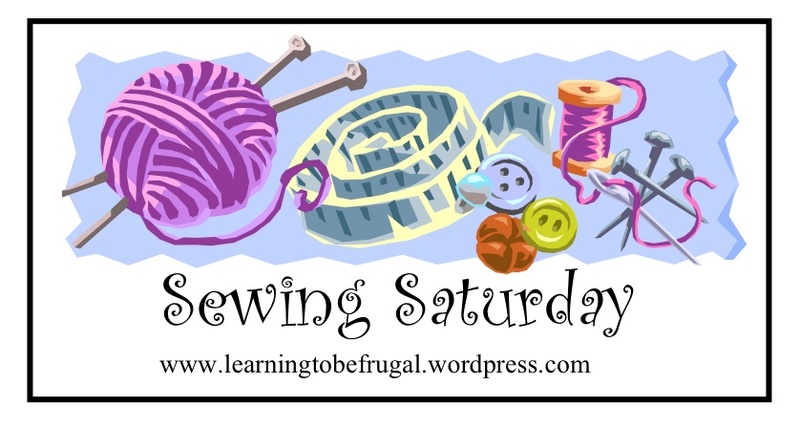 Here is where I’m laying out most of the pattern pieces. 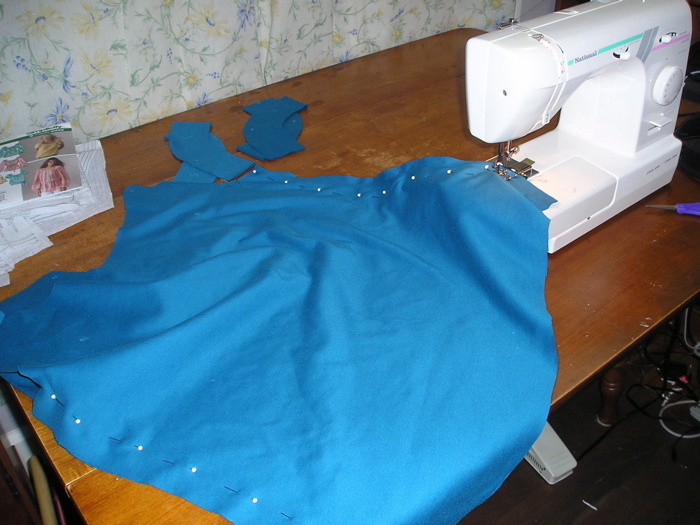 I also needed to refold the blue fabric a different way for the sleeves (1 piece used to cut 2 sleeves), as well as the two curved neck pieces shown above on the upper and lower left. In addition, I had to cut out the two curved pieces with fusable interfacing as well. 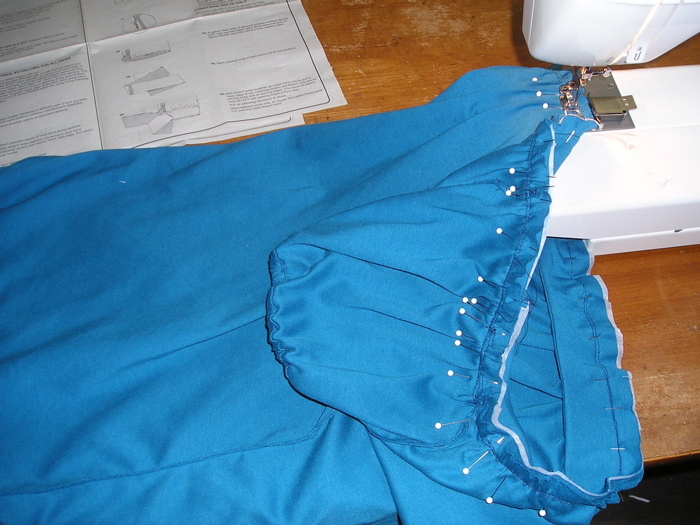 Here, I’m sewing the side seams of the shirt. I reinforced each seam by sewing them again 1/8 from the original 5/8 seam. Then, I trimmed the second closely. In this picture, I’m attaching the neck to the shirt. Before this, I had to gather the top of the shirt. As you can see, I’ve already added the sleeves and put in elastic so that they are puffy. This is the completed shirt. I’ll now show pictures of the sash I made, but I want you to know that I ended up wearing the shirt without the sash. Also, I’m petite across the shoulders, so this one was too wide. I had to pin my bra straps to it. Maybe, I’ll attach some strings or ribbons with snaps to save myself from pinning it each time. If I make another shirt with this pattern, I might try to cut the neck pieces smaller to try and fix the problem of it being too wide. 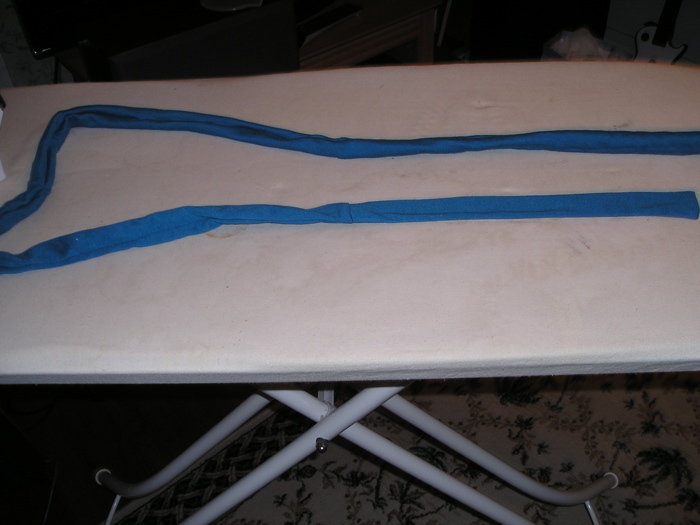 This is the sash as I was in the process of ironing it flat. I hadn’t purchased extra fabric to make it, so I had pieced it together with scraps from cutting out the top. 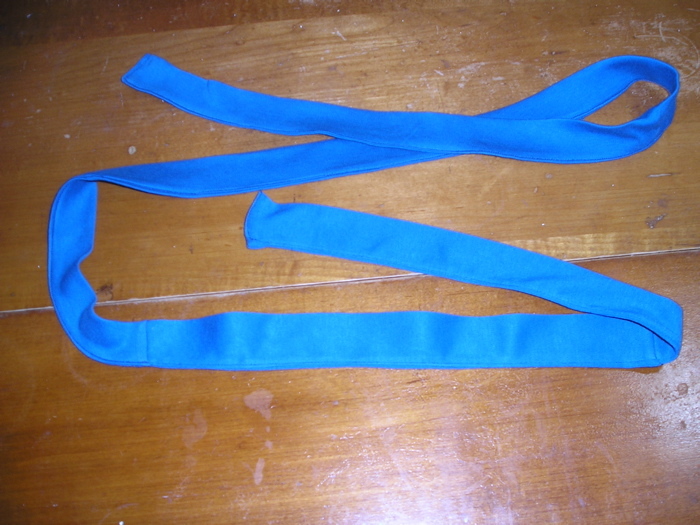 This is the sash after I ironed it flat. I also sewed along the edge, so that it would be easy to iron after washes. The top and sash look great together when flat on the table. On me, it looks much better with the top alone. 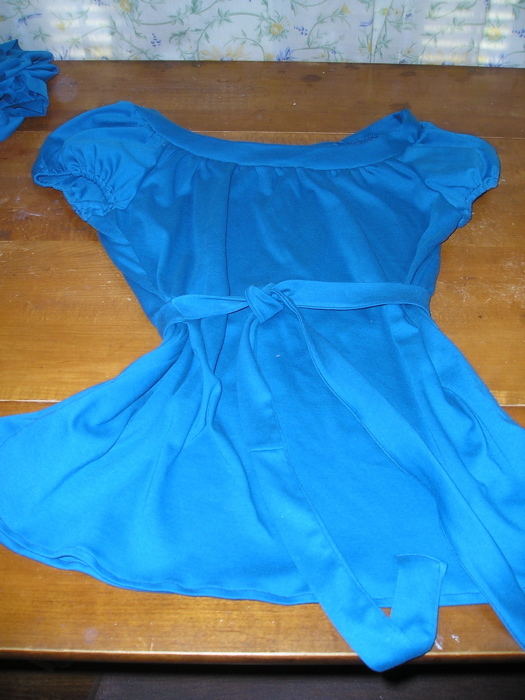 In all, it took me two days to cut out and sew the top and sash. 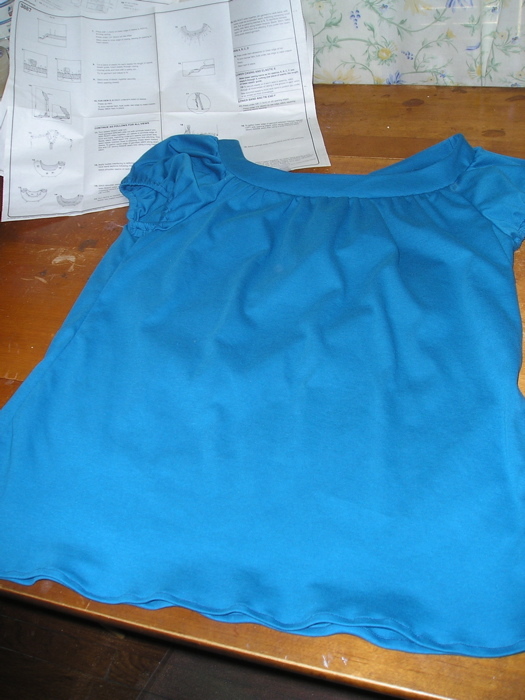 It took a while to put the elastic in the sleeves, gather the top of the shirt, and to make the layered neckline. It’s too wide across the shoulders on me, but when it is pinned in place, it is a very comfortable shirt to wear. I knew this week was going to be a busy one. Since I knew I wouldn’t have time to cook on Wednesday or Thursday, I decided to do several days worth of cooking on Tuesday. Here’s a picture of my efforts. As you can see, things got a bit crowded. It began Tuesday morning before work. Very quickly, I hand-washed all of my pots and pans. My husband had already been taken care of all of the dishes that could go in the dishwasher. That evening when I got home (after swimming! ), I began cooking like crazy. My stove has three burners that work. One is large and two are small. By rotating my pots and pans as things on the larger burner cooked quicker, I was able to handle several pots at once. I also used the oven. It definitely was a good cooking adventure. We have had food to cover lunches and dinners for at least 3-4 days. Plus, my husband helped me clean up! 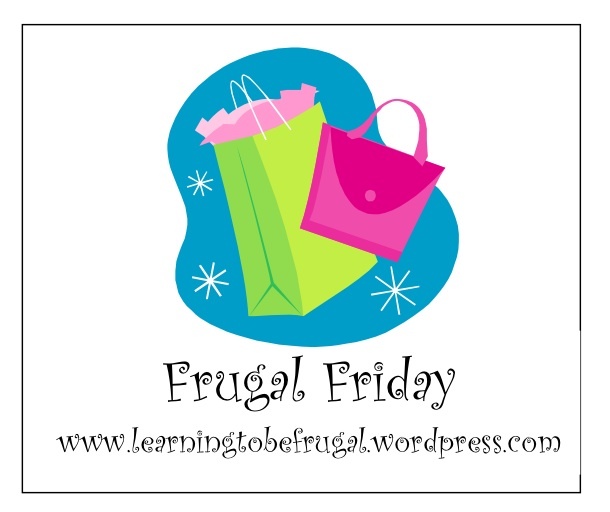 I made my menu and did my grocery shopping last weekend, although I’m just now getting it posted on the site. 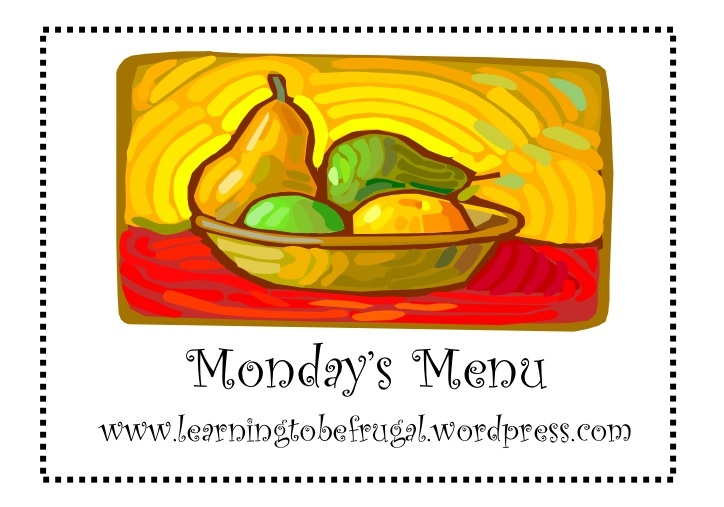 Last week, I did most of my cooking over the weekend or at the beginning of the workweek. Once Wednesday rolled around, I didn’t do any more cooking! I was quite tired and ready to eat sandwiches or leftovers. Looking in my pantry, freezer, and fridge Saturday morning, I found a half jar of marinara sauce, 4 pounds of marinated chicken fajita thighs, a can of black beans, and more lentil soup than I care to think about. There’s still some leftover cheeseburger casserole as well. If that doesn’t disappear in the next day or so, I’ll freeze it in individual portion sizes. I’ve got more in my kitchen to eat than what I just mentioned, but these items were some of the ones that I wanted to consider when making my menu for the week. With the giant bag of chicken fajita meat, I’ll probably cook 4 chicken thighs and freeze the rest in sets of four in vacuum-sealed bags. I got the idea for the roasted peppers and tomatoes from watching Jamie at Home on the Food Network. Jamie Oliver’s new show is great, because he cooks recipes according to what is ripe in his garden. 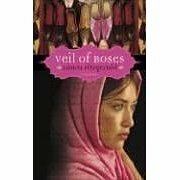 The recipes are very simple and mostly vegetarian, not to mention mouth-watering! For more menu ideas, see I’m an Organizing Junkie.